Acer's Aspire range covers everything from entry-level value laptops to high-performance multimedia models. The Aspire 5542-304G32Bn is a budget machine that packs in some unexpected features at a low price point. One of the stand-out features is the inclusion of a Blu-ray drive, a rarity for laptops at this price. While the 1366 x 768-pixel screen resolution is not enough to take full advantage of the high-definition visuals, images are still crisp and the 15.6-inch LED backlit Super-TFT display provides rich and vibrant colours. Other features also impress, including the 5-in-1 memory card reader and four USB ports, letting you easily connect external storage and peripherals. The 320GB hard drive is enough for storing a large number of songs and videos, while leaving space for essential applications. 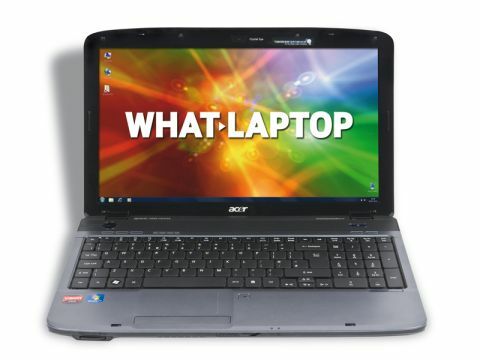 This laptop features Bluetooth for wirelessly transferring files with devices such as mobile phones, or connecting a Bluetooth headset for chatting online. Networking capabilities are also impressive, with 802.11n Wi-Fi and Gigabit Ethernet available for wireless and wired connections respectively. However, portability is sadly limited by an average 199-minute battery life and 2.7kg weight, so this is a laptop built to stay at home. Performance is unfortunately another weak point, and falls short of the Asus K52F-SX065V and Samsung R530. The AMD Athlon II processor still provides enough power for running office applications and basic multi-tasking however, so anyone who wants to edit their spreadsheets or surf the web will be more than satisfied. This laptop also features a ATI Mobility Radeon HD 4200 graphics card rather than the Intel integrated cards that are so popular at this price. While graphics performance is no better than the Asus K52F-SX065V or Samsung R530, it is sufficient for basic gaming and running simple photo and video editing software. Usability is a definite strength, with Acer's usual raised keyboard design in place. Although the flat keys may not suit everyone's tastes, we found them intuitive thanks to the size and travel of the keys. The only downside is the gaps between each key, which lets in dirt and other debris. The touchpad is one of the largest in this group, although easy to brush while typing. Thankfully there's a button for disabling the pad when not needed. Overall, the Aspire 5542-304G32Bn is a feature-packed and highly usable laptop that is only let down by limited power and portability. As a cheap desktop replacement for use at home it is unlikely to disappoint, provided performance and battery life aren't a priority.